Be Known for Something : Discover Your Church Communication Thread / Business Essentials / Your 100 days. Or is that 91 1/4 days? This past week on April, 29, 2009, we celebrated a huge day. Or at least for some. The media definitely showed up! It was, of course, the end of the first 100 days of the Obama presidency. I’m tempted to get into the politics of the day because most people who know me, know that I love to discuss politics. I’m Canadian and can’t vote, but I love to influence people how to vote. I’m tired of hearing people say that it doesn’t interest them or that they could “care less” about it all. Politicians (who we can freely vote for) are the people who adjust our culture. Our businesses and our future. I would encourage you all to watch our leaders now in their decisions and not just before an election (when politicians say what they want you to hear rather than the truth of their actions). Don’t listen to the “spin” of the media, instead start thinking for yourself and determine if the government is doing what you think is best for your country, business, and family. To give you an idea of how much you’ve been watching (or missing) just start by naming the laws that have been signed or the decisions that have been achieved in the first 100 days. Obama’s been busy. And his actions are going to have repercussions long after he’s out of office. 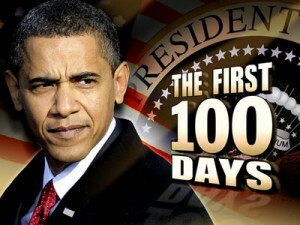 I’ve found it interesting how at the first of the presidency, the “100 days” was said to have been overplayed. Obama said that he doesn’t want to be known for a small period of time, but for his whole 1460 days (or double that if he’s re-elected). But now, the media and even Obama has made this a huge occasion. He even had a national press conference that preempted the prime time lineup on all networks to let you know what he’s been able to accomplish. So, what does this mean for you in business? Ah, I’d love to go down the politic path, but instead, let’s look at the general idea. We all need our 100 days. Franklin Roosevelt was the one who started this idea with the New Deal. In fact, every request to Congress in his first 100 days was granted. Seems almost like Obama. Both Presidencies were in a time of economic crisis. In business, it’s crucial to have goals — that’s why you should know your goals for a certain time period. We often do quarters. Which are 91 1/4 days and not 100 days. I’m not sure why they don’t say quarters for the President (since his head may eventually be on one 🙂 — I guess 100 days has a sexiness about it. Here are some things you need to set goals to do in your next 91 1/4 or 100 days. And then based on their outcomes, you need to set goals for the next period. And on and on it goes. Revenues – Know ultimately how much money is coming in, when and from where. Expenses – If this isn’t in check, it can deplete your revenues faster than you can say Obama. Marketing Budget – shoot for 5-10% of your net revenues (revenues minus direct costs) to this. The more you invest properly, the more the revenue increases. So try to invest as much as you can in the plan. Marketing Plan – know what you’re planning to do for Promotion, Price, Place and Product. Look at Print, Web, Social Networking. Successes – shoot for a certain amount of successes. You know how that is delineated in your business — that can be profit, amount of products sold or billable hours. But set goals for it. Contingency – your emergencies — what will you do “just in case”. A lot of people don’t like setting goals because it takes time. But goals are the only way to tell if you’re succeeding — and where! In the current Calendar year, we are past the first quarter and halfway through the second. So how are you doing? If you don’t have goals, you don’t know how you’re going to change things to make things better. So, go ahead… start now!